Fog and mist are well known phenomen, mostly during the whole year, but seasonally special in some areas. The Japanese kigo are well defined, but their translation in English might not bring the same familiar seasonal ring. As a general rule, the Japanese words kasumi and oboro are haze and mist of spring, whereas kiri is the fog of autumn and winter. Smog usually builds up in the summer months in big cities. Misty memory, hazy mind and such use of adjectives are not considered kigo. All these kigo belong the the category of HEAVEN (天然）. Let us look at the physical nature of these phenomen first. Fog, mist and haze are not precipitation as they don't fall to the ground. Reduced visibility near the ground is caused by tiny particles suspended in the air. Water droplets that cause a moderate reduction in visibility are called mist. Those causing a serious visibility problem are called fog. Mists and fogs often form over seas, rivers, and lakes. Particles of dust, smoke or salt that affect the clarity of the air are collectively known as haze. Fog - visibility below 1,000 m (1,100 yards) - mainly affects aircraft. Thick fog - visibility 50-200 m (55 - 220 yards) - dangerous for road traffic. Dense fog - visibility below 50 m (55 yards) - seriously disrupts all forms of transport. Radiation fog occurs when the land radiates heat into space and the air rapidly cools to the dew point. Radiation fog tends to collect in valleys and other ‘frost hollows' causing motorway pile-ups sometimes because drivers do not slow down enough in foggy conditions. Sea fog - often known as 'steam' fog (over fresh water) or sea smoke (over the sea) forms when cold air is over much warmer water. This is the same effect as cold air turning to steam over a hot bath or hot sink. There needs to be about 9 degrees C difference for this to happen. True steam occurs when the temperature is 100 degrees C.
Advection fog occurs when warm moist air is cooled by a cooler surface, such as over a cool sea in the spring. Fog banks are common in the northwest Atlantic where they form over cold, shallow, offshore waters, such as the Grand Banks of Newfoundland. It also happens when warm moist air blows over a cold sea or lake. Dirty fog produced by air pollution in cities, and often occurring beneath a temperature inversion. The action of sunlight can produce photo-chemical smog. A smokey haze is creating profound problems in Malaysia, according to the Agence France Press. The haze, which is the result of forest fires on the nearby island of Sumatra, is delaying airline flights and creating health problems. Now let us go back to the kigo related to these words. Spring haziness focusses on obscured vision at night, whereas Spring haze refers to any haze or mist, usually during daytime hours. (To complicate things, some refer to haze as "thin mist"). Mist could also be used as a translation for for the above terms. kigo with OBORO are usually refering to evening and night phenomenon. When the temperatures rise during daytime, some moisture in the air shows a hazy landscape in the evening, especially when the moon is bright. Here the feeling of haze includes the deep sound of a distant Japanese temple bell. The hazy Spring moon, the cloudy moon in a veil of clouds is a well-loved expression in Japanese literature since ancient times. Thick fog often builds in the Sea of Ohotsk in Hokkaido. To find their way ships use their horns and whistles. kirisame 霧雨（きりさめ） "fog and rain"
kirishizuku 霧雫（きりしずく） "fog and a drop"
The scent is often from fires burning fallen leaves or weeds. This autumn hokku was written in 1792, probably when Issa was traveling around on the island of Shikoku. It is a highly tactile hokku, with the autumn evening mist rising upward against the momentum of the falling rain, and the physical contact between the flow of the mist and the flow countless raindrops in the opposite direction can be almost felt, as if the two were rubbing against each other (wakete, "push through," is often used when someone pushes through a group of people or a crowd). A feeling of exertion strangely mixes with a sense of lightness and effortless movement as the mist follows the slope of a nearby low mountain until it reaches either the mountaintop or the bottoms of the low-hanging rain clouds. You will recall that Buson was a painter, and he often strives for painterly effects in his hokku, which makes them a bit artificial. It is worth remembering that Buson — not Bashō — was the favorite of Masaoka Shiki, the fellow who nearly destroyed hokku by his revisionistic creation of the haiku near the beginning of the 20th century. It was the “painter” aspect of Buson that Shiki liked, which contributed to Shiki’s notion that his new “haiku” should be a kind of illustration or sketch from life. It is really too intentionally beautiful for hokku, and is somewhat like an impressionist painting. Either way, however, it does what hokku should not do — it pulls our attention in two different directions by comparing one thing with another. Instead of just telling us that people are passing in the morning fog, he goes beyond and tells us that it is like a picture of people passing in a dream — of dream-people passing. Any time we have to use the word “like” to explain something in hokku, it is a warning sign. Hokku should let things just be themselves, not be “like” this or “like” that. 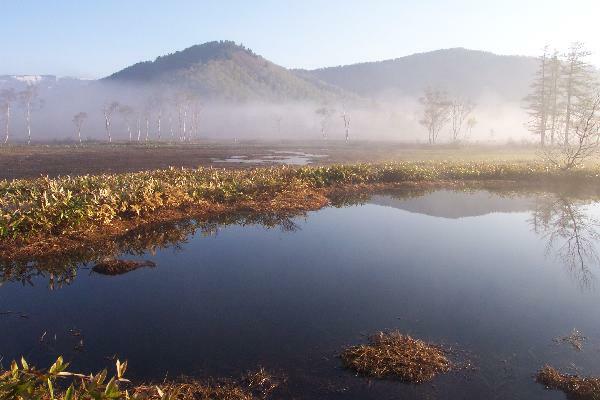 Look at a great collection of Morning Fog photos from Japan. is a famous character in the Genji Monogatari. 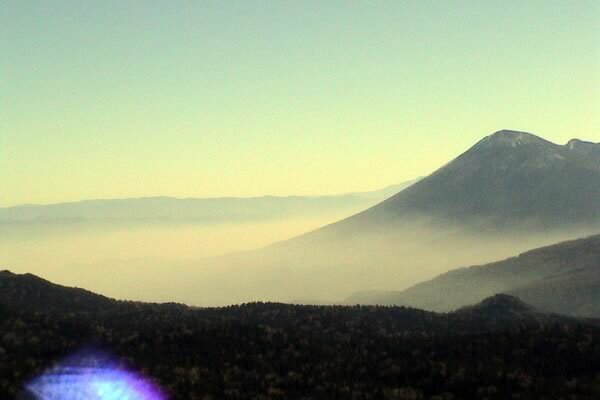 Some placenames in Japan contain fog and mist, since this is the main feature of the local weather. Kasumigaura is located in the southeastern section of Ibaraki Prefecture. As a single lake, Kasumigaura is second only to Lake Biwa in size in Japan, and provides the basis for the region's residential and industrial development. About 200,000 years ago in the middle of the Pleistocene Epoch, the area surrounding Kasumigaura was a part of the ocean referred to as Old Tokyo Bay that extended across the Kanto region. Over time the shallow sea floor that accumulated in Old Tokyo Bay changed into land, forming a plateau 20-40m above sea level that extends across present-day Kasumigaura. after the first significant rainfall. The official time frame for tule fog to form is from November 1 to March 31. This phenomenon is named after the tule grass wetlands (tulares) of the Central Valley. Accidents caused by the tule fog are the leading cause of weather-related casualties in California. Smog and air pollution can be both a summer and winter kigo. One reason for this dual season nature is that the inversion layers that trap the smog are strongest in both summer and winter months. For the past couple of nights, we have had thick fog here in Brussels, right in the city centre, where it normally does not reach. This was quite unusual, and I have been soaking it in -- almost literally!
. VOG (volcanic smog) in Hawaii . Dear gabi san thank you for oboro and gentle ways. this is for you. I must remember to check with your kigo database. I send a bow and warmth. Issa asks how many "ten-thousands" (man) of koku might there be. 1 koku = 4.96 bushels. Mist in Japanese poetry is an image of approaching spring and the new year, but there doesn't seem to be any hint of celebration in this hokku. On one level, perhaps, the hokku is personal and psychological. Read the full comment of Chris Drake . . . The small house must have looked especially luring and elegant in the spring moon.
. Arima Akito 有馬朗人 . heaven or the nether world ? Tokyo Kasumigaseki district　霞ヶ関 "fog gate" , "gate of mist"